It is a shame from the photo that you can't see the texture of the linen embossed card stock but here in London it is dull and I wanted to edit the card to disguise this but in doing this I missed the texture. I know this look like it took 5 mins to make but it was a quite difficult to line up the sentiment to the exact spot I wanted it (no misti for me yet!). Then I really wanted the bubble talk die to be exactly in the middle of the word-so that took some time. I just layered up more bubble talk to get the dimension. The stamps are from the set 'Wait for it' from CAS-ual Friday Stamps. I just finished off with a little bling. The lay out came from the sketch at CAS(E) this Sketch-thought this was a tough sketch at first then this idea just popped into my head. Also want to enter it into the 'Dimension and Bling' challenge at CAS-ual Fridays Challenge. 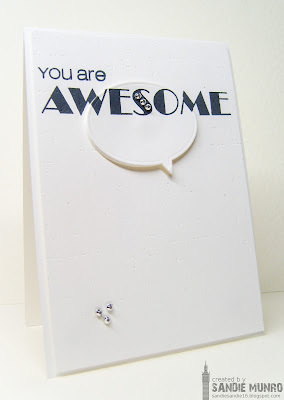 Plus I am going to try out for the Monthy CAS DT call at Happy Little Stampers-I actually have made another card for this but thought my card today was super CAS and why not have a few goes. It felt good to craft after a while of not being too creative. Love this CAS beauty Sandie. The touch of gems in the sentiment and below are perfect! Lining up those sentiments look amazing! Brilliant! Inspired design. I love it. Great card, and congrats on the lining up, definitely not my forte easily! This is a perfect CAS card !! And in our minds, we just think and feel the fine linen texture of the paper. Wow, great design! Love the popped up part of the sentiment! Brilliant take on the sketch over at CTS Sandie - I reckon it's a winner for sure. Love the absolute simplicity of this but can totally appreciate how long it took you to make it look perfect! Thanks for playing along at CAS-ual Fridays! This card ROCKS!! 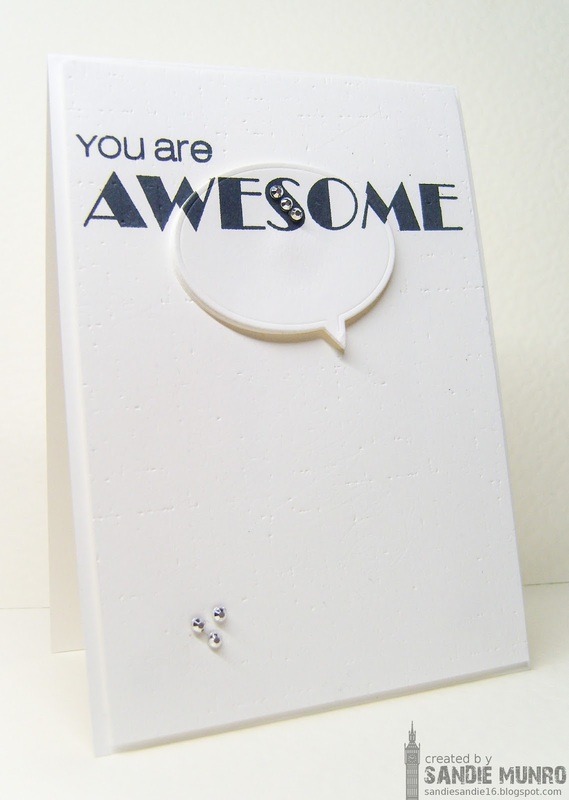 I love it- you are so awesome at CAS!